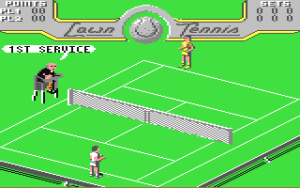 Yawn Tennis... ahem, excuse me, Lawn Tennis, is an uninspiring sports title that's lacking in a number of areas. Only singles matches are available here but there are five different skill levels to choose from. Things quickly unravel once the game starts and you try to serve - most of the time the ball doesn't go where you want it to and you'll lose many points due to double faults. When you do manage to get the ball over the net the isometric viewpoint makes lining up shots very difficult and you'll frequently find yourself swinging at thin air. The court is also slightly obscured meaning that you can't see three corners of the playing surface. This is ridiculous as there's times when you try to line up a shot but fail as you can't actually see where the ball is! If by some miracle you do get a rally going you'll struggle to win a point as the computer is a God even on the lowest skill setting. The only time I won points was when the CPU hit the ball into the net. Speaking of which, can anyone explain to me why the umpire says "Foul!" when this happens? I've never heard this termed used in tennis! To be honest, the only reason to play this game is to see the terrible animation, and the hilariously bad jumping celebration from the CPU after they win a match. Apart from that this game is one to avoid. Random trivia: The music in this game was composed by Jason C. Brooke who also composed the soundtrack to the C64 ports of Contra (Gryzor), Ikari Warriors and Outrun.